If you are thinking about how we should develop an understanding of adding and subtracting integers, it is very important to first consider how primary students should be developing adding and subtracting natural numbers (positive integers). Of the two operations, subtraction seems to be the one that many of us struggle to know the types of experiences our students need to be successful. So let’s take a look at subtraction for a moment. Each of these situations requires different thinking. Removal is the most common method of teaching subtraction (it is simpler for many of us because it follows the standard algorithm – but it is not more common nor more conceptual as difference). Typically, those who have an internal number line (can think based on understanding of closeness of numbers…) can pick which strategy they use based on the question. Think for a moment like a primary student. The first problem is much easier for many! If the only strategy a student has is counting backwards, the second method is quite complicated! In the end, we want all of our students to be able to make sense of subtraction as both the removal and difference! (We want our students to gain a relational understanding of subtraction). Alex Lawson: The Power of the Number Line from LearnTeachLead on Vimeo. How does this relate to Integers? Subtraction being thought of as removal is often taught using integer chips (making zero pairs…). Take a look at the examples below. Can you figure out what is happening here? What do the boxes mean? Again, students view of subtraction is removal here (or with the case of subtracting negative numbers here, students will be adding). Hopefully for many students, they might be able to see how far apart the numbers (+5) and (-2) are. Without going through a bunch of procedures, many might already understand the difference between these numbers. Many students come to understand something potentially difficult as (+5) – (-2) = 7 quite easily! When is it appropriate for us to use difference? When is it appropriate for us to use removal? Should students explore 1 first? Which one? Which is easier for you? Are you sure it is also the easiest strategy for all of your students? The questions above have no context of any kind. I wonder if this makes this concept more or less difficult for our students? How do you provide experiences for your students to make sense of things, not just follow rules and procedures? How can we avoid the typical tricks used during this unit? Did she get the right answer? She explained that 58 and 78 were 20 away from each other, but 58 and 71 weren’t quite 20 away, so she needed to subtract. I asked her a few questions to push her thinking with different numbers to see if her reasoning would always work. Is her reasoning sound? Will this always work? Try a few yourself to see! 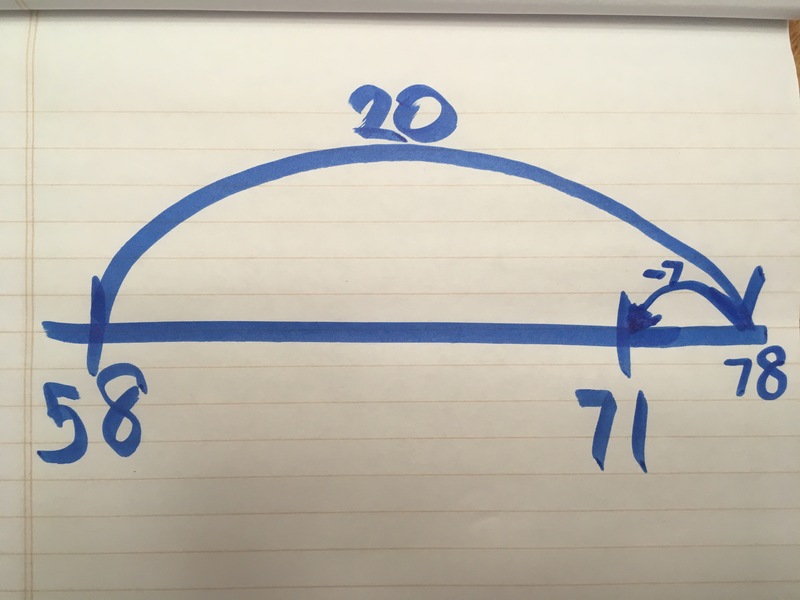 Typically, we look at subtraction as REMOVAL (taking something away from something else), however, this student saw this subtraction question as DIFFERENCE (the space between two numbers). I wonder what would have happened if I “corrected” her mathematics? I wonder what would have happened if I neglected to listen to her thinking? Would she have attempted to figure things out on her own next time, or would she have waited until she was shown the “correct” way first? I also wonder, how often we do this as teachers? All it takes is a few times for a student’s thinking to be dismissed before they realize their role isn’t to think… but to copy the teacher’s thinking. Think about this from the students’ perspective. What happens when we start to question them? Do you tend to ask funneling questions or focusing questions? How do we get better at asking questions and listening to our students’ thinking? What barriers are there to getting better at asking questions and listening? How can we remove these barriers? Is there a time for asking funneling questions? Or is this to be avoided? What unintended messages are we sending our students when we funnel their thinking? … or when we help them focus their thinking? What if our students’ reasoning makes sense, but WE don’t understand?